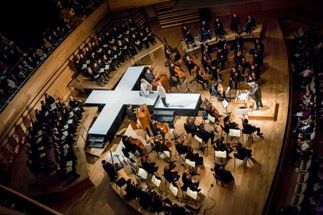 As part of the annual Montreal Bach Festival, the Orchestre symphonique de Montréal (OSM) presented a “staged” production of the Passion According to St-Matthew. This basically comprised entries and exits by the soloists who performed on or around a large central cross cradling the two choirs and orchestras. (I wonder what hard-nosed Christians thought about this.) The dramatically-lit cross lent a mysterious and other-worldly aspect to the performance, more effective than the sombre production by Peter Sellars that I attended at the Berlin Philharmonie in 2014. Soloists wore contemporary, casual clothing. For the Part One choruses, the boy trebles sang from the choir loft. Bach’s supreme masterwork is a cornucopia of contrasts–ranging from the lyrical to the dramatic–reflective arias, meditative chorales, unifying recitatives and momentous choruses. This production succeeded on some levels, but overall failed to captivate and inspire. The high point (not surprisingly, given their power) were the chorales and choruses, especially at the end of Part One, when Les Petits Chanteurs du Mont-Royal joined the OSM Chorus for an ecstatic rendering of “O Mensch, bewein’ dein Sünde gross”. The choral work was exemplary for color, nuance and judiciously-modulated dynamics. From where I was sitting in the back of the second balcony, however, the texts were largely indecipherable. Also, because the two choirs were only several feet apart it was often impossible to distinguish which one was singing, particularly unfortunate for the opening “Kommt, ihr Töchter, helft mir klagen...” during which the first chorus responds to the “Whom?, How? and What?” questions from the second chorus. Similarly, if it hadn’t been for the intruding cross, the novice listener may not have noticed that there were two separate orchestras on stage. The orchestras, of about 20 members each, were in fine form and Nagano conducted with a sure hand, paying meticulous attention to accents, balance and phrasing. Bassonnist Stéphane Lévesque in continuo 1 was the star. The two first violins stood for their respective solos in Part Two, and Friederike Heumann was more distracting than edifying as she tore her way through the viola da gamba parts. Never tiring, tenor Julian Prégardien as the Evangelist and baritone Gordon Bintner as Jesus performed the recitative roles with well-modulated power and conviction. Although Jesus is usually portrayed by a bass, Bintner had no trouble with his sustained lower notes. The production failed to hold up, however, because of the solo singers. Apart from the smoothly-rounded bass of Geoffroy Salvas in the secondary role of Pilate, none of the others projected the beauty and sublimity that are essential to the success of this work. Poor projection, especially from soprano Sarah Wegener and alto Ann Hallenberg (and the latter’s often inaudible low notes) combined with the ragged tenor of Michael Schade and labored bass of Christian Immler made for some tedious listening, especially as the arias comprise the longest numbers in the work. Sadly missing from this production was the booklet containing the texts (German, English and French) that was distributed for the OSM’s 2009 performances. Instead, English and French translations, with no indication of who was performing which part, were projected onto two screens hanging from the rafters.